Rags 2 Riches was a group that didn't get much of a chance to play together. But, when they did they made the most of the opportunity. They recorded an album that has become a favorite of many an old time music fan. Simply entitled Rags 2 Riches, the album contains 15 songs performed by a group of musicians that play for the shear joy of it. Pictured here during a rare live performance at the world renown Dulcimer FunFest in Evart, Michigan. This performance took place in July of 1996. 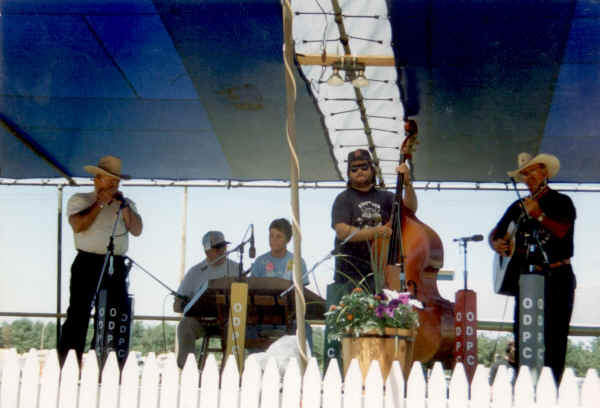 From left to right the members of the group were: the late Ron Bain on harmonica, the late Floyd Fox on tenor banjo, Sandy Holder on hammered dulcimer, Jeff Gardner on bass and Chuck Miner on guitar. The passing of a dear friend was the motivation for Jeff to make studio recording a high priority. Rags 2 Riches was the first project that he produced after his renewed commitment to recording the wonderful friends and musicians in his acquaintance. The passing of Ron and Foxy have served to drive home that commitment and this web site is but one of the fruits of that commitment.